Mbuyiseni Ndlozi was born in 1985 and grew up in Everton in the Vaal area of Gauteng. He is the youngest member of the Economic Freedom Fighters and the National Spokesperson for the party. 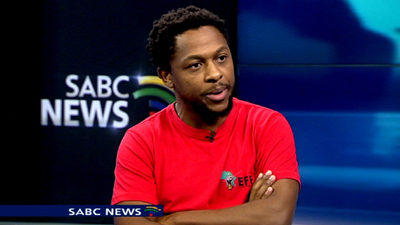 Ndlozi is also a PhD student in Political Sociology at the University of Witwatersrand. He was brought into political consciousness in 1992 when my uncle was jailed by the apartheid police force for his involvement in the underground activities of the liberation movement. He says for the first time in his life He began to understand the oppression in the country, which He would later understand as racist, colonial and capitalist. His political participation in mainstream politics came later in the form of participation in youth movements. He joined the South African Students Congress, the ANC Youth League (ANCYL) and the Young Communist League (YCL). He served in the Palestinian and Cuban international solidarity movements. In 2013, I was involved in the “No Obama Campaign” that was initiated by some youth political congresses in the country. Message to South Africans: The EFF’s message to the youth of South Africa is that there should be economic freedom in our lifetime. I see this as a generational mission aimed at ensuring that South Africa is truly economically liberated. I believe that in the past 360 years, since colonial dispossession of the people began, their means of subsistence has been taken from them.